Welcome to The Abso!ute Sound online! We explore music and the reproduction of music in the home. We believe that the sound of music, unamplified, occurring in a real space is a philosophic absolute against which we may judge the performance of devices designed to reproduce music. Our goal is to provide the resources consumers need to judge how a component's sound either honors or departs from the music's truth, and to make sound purchasing decisions that maximize their experience of reproduced sound. 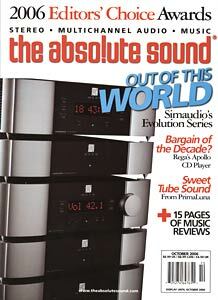 Below is our Issue 165, October 2006 table of contents and editorial. Paul Seydor on three full-out assaults on the state of the art. 35 pages of TAS Recommended Products. Harry Pearson picks his best of the best. Jim Hannon on a musical and affordable tube amp. Breakthrough performance, bargain price, says Chris Martens. Jacob Heilbrunn on two mid-priced overachievers from England. Barry Willis on how to move from geekdom to pro audio in one leap. Reviews of Haydn’s Orlando Paladino, Walton’s Symphony No. 1, Joel Fan’s World Keys, Stravinsky’s Les Noces on SACD, Mercury Living Presence Russian Recordings LP box set, and a classical music encyclopedia. Reviews of more than a dozen new albums and reissues, including the latest from Califone, Ali Farka Toure, Mountain Goats, Black Keys, M. Ward, Hidden Cameras, and Psalm One. Also, vinyl from Golden Smog and Neil Young, and the lowdown on the second batch of Cure reissues and Austin City Limits live discs. The skinny on the latest from Jason Moran, Keith Jarrett, Susanne Abbuehl, Ornette Coleman, and a pair from Brad Mehldau. Plus, a box set from Weather Report and an SACD from Wayne Horvitz Gravitas Quartet. 13 Questions for EveAnna Manley, by Neil Gader.